The all-new Dunlop Sportmax Q3+ offers more longevity on the street and the track, plus more grip, stability and steering feel. More than 80-percent of the Q3+ has been redesigned compared to the Q3. 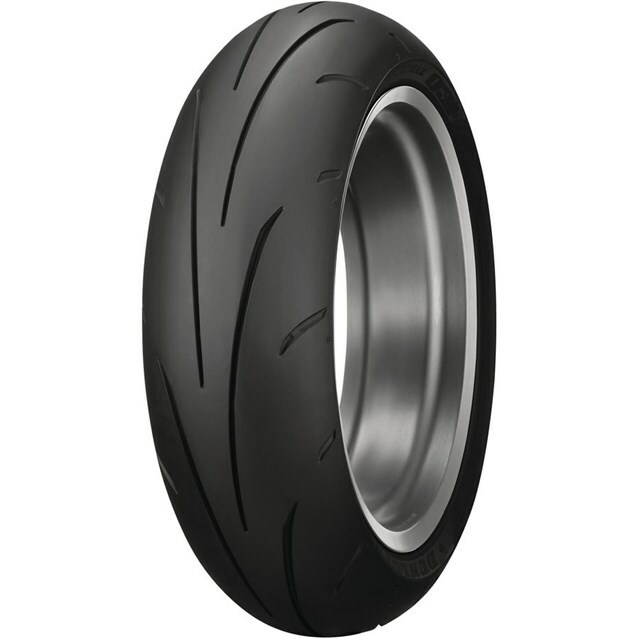 This is the ultimate in hyper-sport tire performance for serious sport riders and track-day riders, and offers extended tire life so you can spend more time on your favorite tracks and roads. Handling: Because bikes are meant to lean over. CFT: Carbon fiber reinforcement in the tire sidewalls for exceptional cornering performance and feel. Multi-Tread: Two compounds in the same tread give riders great mileage without sacrificing handling. Made in the U.S.A. Only Dunlop makes motorcycle tires here for the way you ride here. Only hypersport tire made in the U.S.A., the Q3+ was designed at Dunlop's Buffalo, NY headquarters, and manufactured in the Buffalo plant on the same high-tech production equipment as Dunlop's racing tires. Dunlop's Huntsville Proving Grounds is the only motorcycle tire test facility of its kind in North America, and the Q3+ was tested extensively at Dunlop's Huntsville Proving Grounds as well as several racetracks in the U.S.
Dunlop's Carbon Fiber Technology (CFT) employed in the Q3+ uses carbon fiber reinforcement in the tire sidewalls for exceptional cornering performance and feel. Intuitive Response Profile (IRP) technology in the Q3+ rear tire allows greater latitude in line choice while cornering, plus amazingly linear steering. MT Multi-Tread technology in the Q3+ rear tire uses a silica-infused, long-wearing compound in the center of the tread for longer tread life, and special lateral grip compounds on the left and ride shoulders for outstanding grip.